Peanut butter. Oh peanut butter. How I love thee. You can almost bet that if a cake, cookie, candy, cracker, sandwich, or any other food has peanut butter in it, I will like it. Most of the time I will love it. It's weird because peanut butter isn't my favorite to just eat out of the jar. I much prefer almond butter or cashew butter. But peanut butter foods. Yes! And these are no exception. They are a bit thinner than a "blondie" or cake square and a little more dense also. There's also a subtle sweet maple flavor that adds a little something special to these. So if that sounds like something you would enjoy, these are a must try! 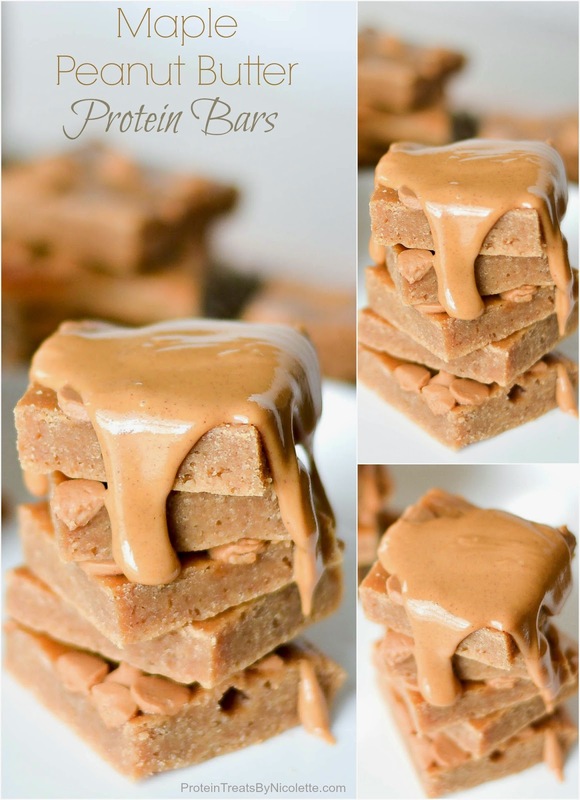 They're dense and chewy peanut butter maple perfection bars. Enjoy! 1. Preheat oven to 350 degrees F. Line a 9x9” baking dish with parchment paper. 2. Whisk together yogurt, maple syrup, peanut butter, almond milk, and egg whites in a mixing bowl until smooth. 3. Add in the remainder of ingredients to the mixing bowl and stir until well combined. 4. Pour batter into baking dish and spread out evenly. Since these are bars, they will not be very thick. Add peanut butter chips on top, if desired. 5. Bake in the oven for 14-16 minutes and let cool for 10 minutes. Cut into 16 even squares and enjoy! * You can bake these in an 8x8” baking dish also. Just increase the cooking time slightly. this sounds like the perfect afternoon snack! can't wait to try! I HAVE to try this! Can I sub for almond butter? Yes you can :) You won't get as strong of a peanut butter flavor but the PB powder will help. Let me know how you like them.